Interior design and decorating trends constantly change because we find new ways to express our individuality. With kitchen remodels still topping the list of projects for many people, we thought we would explore a unique kitchen trend for 2019: combining different colors or mixing different styles of cabinets into our once uniform-styled kitchen. One of the biggest trends, two-toned kitchen cabinets in different styles or colors brings a contemporary chic flair into an otherwise static interior, adding pizzazz to any traditionally designed kitchen. 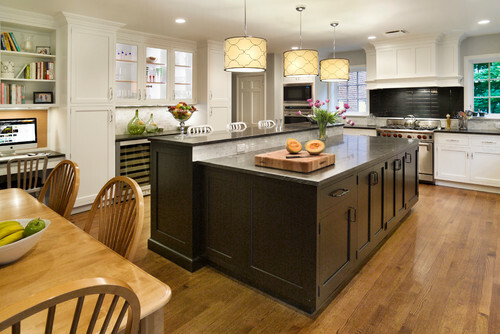 By combining different colors or styles together,a fresh new look and feel is brought to traditional kitchen design. This trend extends to other parts of the kitchen as well. You can use complementary tones with your walls to contrast with the cabinets, or even select darker wood floors or statement floor tile to enhance the look of the room. So why not go rogue and be daring? You’ll be surprised at the beautiful results. Another example of this exciting trend for 2019 is glass door cabinetry mixed with traditional cabinet doors and in two different colors. The ability to see your beautifully organized dishes, glassware and other utensils adds a touch of elegance to your newly updated 2019 kitchen. The two-toned kitchen isn’t just about different colors; it also includes different shades of the same color. Another idea: painted cabinets sharing space with the wood grain cabinets brings two worlds together. It is safe to say that the hottest 2019 kitchen trends are one of expression and originality, and it’s done by using juxtaposition. The act of putting different things close together for contrast seems to create its own beauty. Perhaps the rest of the world can learn from this.